Peregrine falcons, the fastest animals on Earth, can dive through the air at more than 200 miles per hour in pursuit of prey. These impressive birds are native to Acadia; however, human impacts from nest-robbing to environmental toxins caused a severe decline in peregrine populations in the mid 20th century. In the 1960s, researchers determined that peregrines were no longer breeding in the eastern US. When Congress passed the 1973 Endangered Species Act, Acadia National Park responded enthusiastically by participating in a cooperative management plan to restore a self-sustaining population of peregrines to the eastern United States. Since 1997, Friends of Acadia has participated in this effort by supporting peregrine falcon monitoring and education. 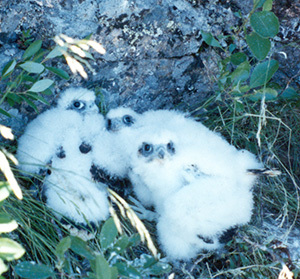 Young peregrines were reintroduced to Acadia in 1984, and in 1987 the first adults returned to the park. The year 1991 marked the first successful nesting pair in 35 years, and in the years since Acadia has become a very successful breeding location for these magnificent birds. The Precipice trailhead at Champlain Mountain along the Park Loop Road is perhaps the best summer location to view peregrines at Acadia. Thanks to contributions from Friends of Acadia, the park hires a “Raptor Intern” each summer to staff the viewing platform at the trailhead. Mornings from mid-May through mid-August, spotting scopes offer close-up views of the nest, and the intern is on hand to talk with visitors about the falcons’ behavior and life history. Starting in 2013, a project of the Acadia Youth Technology Team now enables more visitors to simultaneously view the nest on a large digital screen. For more information about the peregrine falcon program, visit https://www.nps.gov/articles/Peregrine-Falcons-in-Acadia.htm. And watch this by-kids-for-kids video about peregrines created in 2016 by the Conners-Emerson (Bar Harbor) Robotics Team! In the fall, as the peregrines migrate southward, the intern assists park staff with the Hawk Watch atop Cadillac Mountain. Hawk Watch provides an excellent opportunity for visitors to view and learn about multiple species of raptors as they ride the air currents up and over the mountain. On average, 2,500 individual raptors fly over Cadillac during the Hawk Watch season, late August through mid-October. 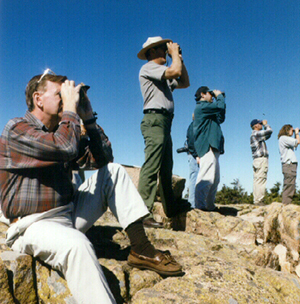 Hawk Watch on Cadillac Mountain is conducted daily from 9 a.m. to 2 p.m., weather permitting. The location is 1/4 mile down the Cadillac North Ridge trail starting from the Cadillac Summit parking lot. Hawk Watched is jointly staffed by the Raptor Intern, ANP staff, and staff from Schoodic Institute. For more information, visit http://www.schoodicinstitute.org/what-we-offer/citizen-science-opportunities/hawk-watch-cadillac-mt/. Please observe all trail and area closures in Acadia. The Precipice, East Face, and Jordan Cliffs Trails and the northern section of the Flying Mountain Trail are typically closed during the breeding season, late March through mid-August—signs at trailheads indicate the closures. In the fall, help to count migrating raptors at the Hawkwatch on Cadillac Mountain—no experience necessary!